Walk in the footsteps of California-bound emigrants as they begin their struggle across the Great Basin. Imagine weary oxen pulling wagons past the Twin Sisters rock formation as they marveled at the cathedrals and cottages created in stone around them. Read inscriptions carved and painted in the soft rock beside Goose Creek, above a meadow once crowded with wagons, animals, and people. Listen to the sound of running water and singing meadowlarks at the headwaters of the Humboldt River. Wagon trains were once strung out along this river’s entire length. From the “Parting of the Ways”, where the Oregon and California Trails separated, this book follows the California-bound wagon trains. It describes sites such as the City of Rocks, Record Bluff, Goose Creek, Thousand Springs Valley, Humboldt Wells, and the Humboldt River. Historian Charles Greenhaw conveys the history of the trail, describes the landscape seen by early travelers, and depicts their travails as they began their trek across the Great Basin. 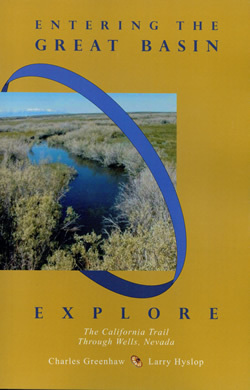 Diary excerpts use the original travelers’ voices to describe the scenery and the trail through Northeastern Nevada. Maps and route descriptions help historical time travelers to visit historic sites along the California Trail.